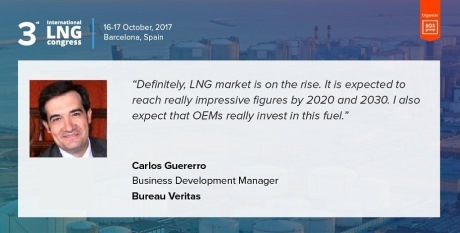 Bureau Veritas is pleased to participate in the upcoming International LNG Congress, - 16th-17th October - held in Barcelona, Spain. COME VISIT US IN BARCELONA! Bureau Veritas has been providing Marine & Offshore Services to the industrysince 1828, with 2,650 staff worldwide. Our mission is to promote safety at sea. As such, our footprint can be found throughout the LNG chain. We serve all industry sectors; offer both classification and advisory services. We work closely with the International Maritime Organization and with flag authorities to implement their regulations. For further information & detailed conference program, please visit the Official Website.